Our Hydrotherapy pool is the perfect way for babies to be introduced into the water as well as being ideal for physiotherapy or rehabilitation. With a warmer temperature, lights and music the environment is relaxing and inviting. 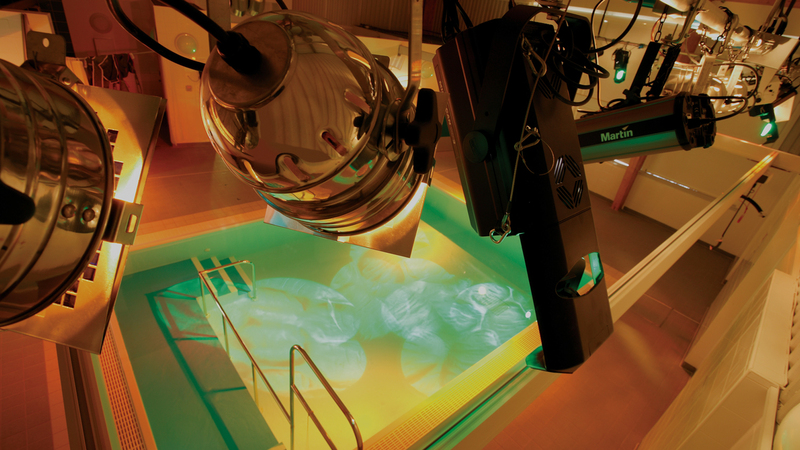 The hydrotherapy pool measures 6 X 4metres with a maximum depth of 1.2metres. The pool features a gradual entry with steps and a ramp for ease of access. Our warm baby swims are a great way to introduce your under 2 to the pool environment. As well as the water temperature being at a very comfortable 34 degrees there are also disco lights, background music and toys to help stimulate your child’s senses. We currently run our warm baby swims, throughout school term times, on a Monday evenings 5.15pm - 6.30pm, Tuesday evenings 5.15pm - 6.30pm, Saturday afternoons 12:00pm - 4pm & Sunday mornings 09:00am - 1pm. We also run additional sessions throughout school holidays, please ask a member of staff for more information on these times. Due to the popularity of these sessions, we do ask that payment be made upon booking. All slots are available 7 days in advance and payment can be made in person at the centre, via the phone or alternatively online via the link below. Please note that one slot covers access for one adult and one accompanying under 2. If two or more adults would like to attend then the appropriate amount of slots must be booked. Seating is provided for spectators within our hydrotherapy pool and there is no additional cost for spectators. The Hydrotherapy pool is also available for private hire whereas you can have exclusive use of the swimming pool for an hour. This is a great option for families looking to have the pool for themselves or for those wanting to utilise the warmer temperature for physiotherapy. For more information on available times for exclusive hire of the hydrotherapy pool then please speak to one of our members of staff who will be happy to help. Alternatively use our contact page. Our Hydrotherapy pool is also home to the Water Babies group. Water Babies provide lessons from birth until 4 years. For more information on Water Babies, please visit our clubs page. The Circle, Hadley Learning Community, Crescent Road, TF15JU.